Remember the task force that President Trump created via executive order to study ways to fix the ailing finances of the Postal Service? The long-awaited report was issued this week with the group’s findings and recommendations. The White House has warned that if the Postal Service does not reverse course, at some point a bailout courtesy of the taxpayers will be needed to keep the agency afloat. It also noted that a large part of the Postal Service’s financial troubles stem from its antiquated business model which “was sustainable in an era where mail volumes and revenues grew alongside population and economic growth” but is losing ground due to the shift to digital correspondence. The Task Force made several recommendations to help the Postal Service reverse course towards profitability. One that was absent from the list: outright privatization. There was concern among critics for months in advance of the release of the report that privatization might be one recommendation. Postal unions, for example, staged rallies around the country arguing against privatizing the Postal Service, saying it would degrade mail service. A frequent comment we see from FedSmith readers is with respect to the pre-funding requirement for USPS retiree benefits. The gist of this comment is that if this requirement were removed by Congress, most of the Postal Service’s financial woes would disappear. The task force addressed this in its report. It noted that the USPS “has been the one civilian entity that is statutorily required to pay OPM directly for the cost of its retiree health benefits.” Further, it notes that the Postal Service has been defaulting on these payments in order to maintain its normal operations. The Task Force does not believe that this general policy [funding retiree health benefits] should change or that the liability for USPS retiree health benefits should be shifted to the taxpayers. The Task Force believes that this obligation, including the $43 billion in pre-funding payments that the USPS failed to pay into the Postal Service Retiree Health Benefits Fund and the unfunded actuarial liability for retiree health benefits, must be restructured with the payments re-amortized with a new actuarial calculation based on the population of employees at or near retirement age. Instead, the Task Force has made other recommendations that it thinks will help the Postal Service more than changing this pre-funding requirement. USPS employees enjoy a pay and benefits premium over their private sector counterparts, although the size of this premium is likely falling. Consistent with the President’s Management Agenda to modernize the government workforce and better align the compensation of federal employees with the labor market, the Task Force recommends that the USPS more closely align compensation for both its career and non-career workers with peers in the broader labor market. The Task Force said the Postal Service must have authority to charge market-based prices for both mail and package items that are not deemed “essential services.” It notes that while USPS does have pricing flexibility within its package delivery segment, the pricing for packages has not been set with profitability in mind. Concerns about this have been raised by outside groups. The Package Coalition, a group formed in advance of the Task Force report to advocate keeping Postal shipping prices low, says that it opposes “legislative or regulatory changes that would force the Postal Service to raise its prices above market rates” and will almost certainly push back against this particular proposal from the Task Force. Companies like Amazon that ship many packages would feel the pain of market-based pricing for shipping packages, if the Postal Service were to adopt them as the Task Force suggests. “If they go to market pricing, there will definitely be a negative impact on Amazon’s business,” said Marc Wulfraat, president of logistics consultancy MWPVL International Inc. He estimates that a 10% increase in prices would increase Amazon’s annual costs by at least $1 billion. That would most likely ultimately be passed onto consumers in the form of higher prices. The Task Force also said that the Postal Service should look at new revenue opportunities, one of which is franchising the monopoly it enjoys on private mailboxes to other companies. In essence the way this would work is the Postal Service would let other companies pay a fee to put packages into mailboxes to expand its revenue stream. “This could be done by retaining the mailbox monopoly and allowing regulated access, for a fee, to certified private companies. These ‘franchisees’ would be granted access to the mailbox for the delivery of mail and small parcels,” said the Task Force report. The Task Force has taken its job seriously and done a commendable job in thoroughly analyzing the Postal Service’s business model and making recommendations for improvements. Hopefully, the recommendations will be taken seriously and at least serve as a starting point for discussions to reform the Postal Service. There is going to be a lot of resistance to these proposals. Unions will hate the idea of giving up collective bargaining over their salaries since this would likely mean less pay and benefits for them. Private companies like Amazon will not want to pay higher prices for shipping packages. Consumers would not want the higher costs for products that would ultimately come from companies passing the higher shipping costs onto them. The reality is there are no easy answers, but something eventually has to give. An organization cannot lose billions of dollars every year and expect to continue the trend indefinitely; the money has to come from somewhere. 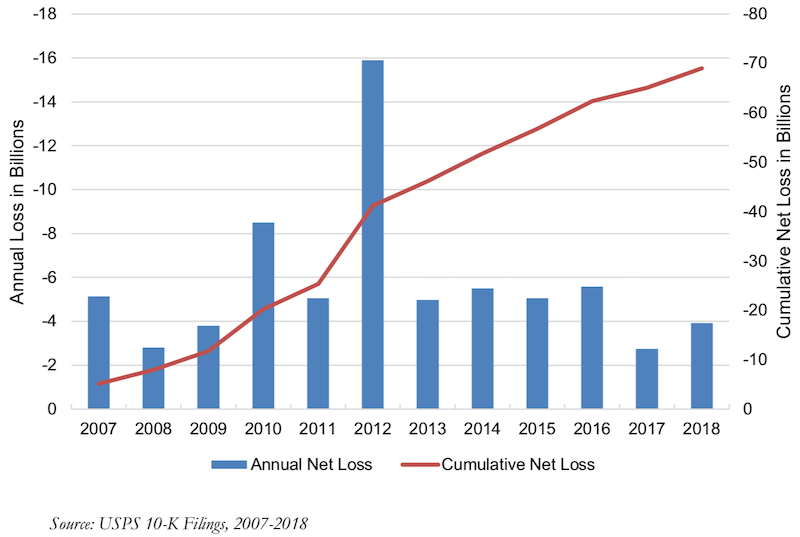 Critics often dismiss the idea of a bailout of the Postal Service as an impossibility, but if it keeps losing money at its current rate, it can happen; the math speaks for itself.